This is my third year that I have the privilege to be part of the Bemis Center for Contemporary Art Auction Program. As most people already know I don’t sell art work unless for a good cause or as mean of exchange. The proceeds of the sale of this work will be donated to the Center to support the work of other artists that like me greatly benefited of the residency program. If you can please support my work and the Bemis Art Center. Claudia Borgna graduated from Genoa University (Italy) in Foreign Literature in 1998 and received a Fine Art BA degree from London Metropolitan University (UK) in 2005. Since then she has been leading a nomadic life style exhibiting nationally and internationally while attending fellowship residency programmes. She is a recipient of the Joan Mitchell, the Pollock-Krasner Grant and the Royal British Society of Sculptors Bursary Award as well as the Pritzker Foundation Endowed Fellowship Award. Voted the ‘Public Speaks’ winner for the 2010 Broomhill National Sculpture Prize (UK), she also was short-listed for the BBC2 documentary: “School of Saatchi” and for the British Women Artists Prize. Claudia’s artificial landscapes are the materialization of an ongoing observation and questioning of how the ‘plastic’ and the natural realms interact with one another and thereby come to create new ephemeral orders. Her flimsy, constructions are only intended for the moment: apt to collapse and subject to change. Mixed media, 11 x 23 x 3 in. 0 CHARS / 200 REMAINING. Claudia Borgna transforms mundane white plastic bags into sculptures/installations that recall Romanticism in their approach to the culture-nature dichotomy. What is most striking about her installations is not necessarily their transformation of the cheap, disposable, but universal plastic bag into works of unusual beauty, but her non-judgemental fascination with the material and its relationship to our environment. It’s difficult to find anything environmentally conscious or preachy in her work; on the contrary, Borgna seems singularly committed to revealing the splendour in these unexpected man-made formations. This fascination is particularly evident in installations with wistful titles like ‘Never the same again: still searching for Newfoundland’, ‘blow me away if you can’ and ‘and they lived happily ever after’ where the ubiquitous plastic bags, usually associated with some of the worst excesses of consumerist culture, are transformed from suffocating objects of destruction into organic motifs. Borgna treats the bags -– always a visual hair’s breadth away from the dirty plastic bag we’ve all seen caught in the windshield of a car or in bare tree branches – almost as if they were natural objects. The random and haphazard interaction of the plastic bag with nature is here transformed into something more deliberate. Although it is possible to view installations like ‘Never the same again: still searching for Newfoundland’ as a continuation of the Land art ethos of the 1970s, a fruitful comparison might also be made with the European movement loosely categorised as Romantic art. In the nineteenth century artists like Caspar David Friedrich saw in nature an expression of the philosophy of the sublime, which in general terms describes the pleasure (and existential terror) of looking at objects of great magnitude. Likewise, Borgna not only marvels at the extraordinary and possibly sinister effect that the plastic bag creates in nature, but also deliberately exaggerates this juxtaposition for greater visual effect. The stray plastic bag caught in nature in this case embodies a subverted concept of the sublime that includes man-made shapes of modernity as legitimate objects of wonder. Angela Roberts is a freelance writer currently living and working in Heidelberg, Germany. Some lovely and beautiful work. Thank you for drawing our attention to Claudia Borgna! 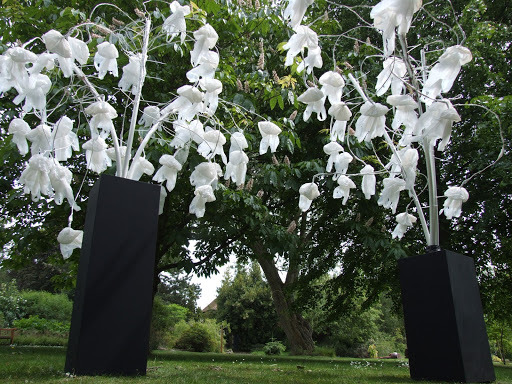 Claudia Borgna ARBS is exhibiting at the tenth annual exhibition of international sculpture at the University of Leicester, UK, entitled ‘A Decade of Sculpture in the Garden’. This highly popular exhibition, which takes place in the idyllic setting of the University’s Botanic Garden, will run until Sunday 30th October 2011. Claudia Borgna whose site-specific installation ‘Weep me to Hollow Tears’ is on display, studied literature at Genoa University and Fine Art at London Metropolitan University. Claudia travels worldwide with her medium: recycled plastic bags. She sets them in ephemeral installations to interact with the surrounding environments. The creation of new artificial landscapes is her means to attempt to understand the ‘nature’ of our world. Work by more than sixty sculptors will be on display at ‘A Decade of Sculpture in the Garden, from the USA, Germany, Iceland, Italy, France and the UK, with a number of sculptures by members of the Royal British Society of Sculptors. ‘A Decade of Sculpture in the Garden’ will run until Sunday 30th October. Normal Botanic Garden opening times are 10am-4pm Monday-Friday all year (except for the Christmas-New Year period) and on Saturday and Sunday from the third weekend in March to the second weekend in November. Admission is normally free except for special Open Days. The entrance to the Garden is in Glebe Road, Oadby, Leicester. Laurence Ambrose, Mary Anstee-Parry, Michael Dan Archer, Rosemary Barnett, Richard Baronio, Alison Barwick, Mark Beattie, Nicola Beattie, Helaine Blumenfeld, Claudia Borgna, Ralph Brown, Jon Buck, Ian Campbell-Briggs, John Sydney Carter, Peter Carter, Lynn Chadwick, Frédéric Chevarin, Peter M Clarke, Angela Conner, Terence Coventry, Stephanie Davies-Arai, Jon Edgar, Richard Fenton, Robert Fogell, Ken Ford, Bill Forster, Susan Forsyth, Angela Godfrey, Lorna Green, Charles Hadcock, William Harling, Stephen Hitchin, Derek Howarth, Steve Hurst, Polly Ionides, Rick Kirby, Robert Koenig, Margaret Lovell, Jeff Lowe, Michael Lyons, Diane MacLean, Ian Marlow, Barry Mason, John W Mills, Nick Moran, Gudrun Nielsen, Denis O’Connor, Austin J Orwin, Rita Phillips, Louise Plant, Tony Roberts, Peter Sainty, Inger Sannes, Brele Scholz, Andrew Smith, James Sutton, Jilly Sutton, Almuth Tebbenhoff, Richard Thornton, Julia Vance, Sheila Vollmer, Peter Walker, Jacek Wankowski, , Olive Wootton.